Being "Ashes" time with Australia playing England at cricket, I was relegated last night to another room away from my usual daylight bulb! I found the subdued lighting hindered my attention to perfect detail but at least I could still enjoy the colours. As I go away tomorrow for a few days, it was important to get my work completed so I could post it today. I fancied doing a grid pattern I'd not used before, so selected Maelstrom. I quite liked the lacy fan effect. Then I played around with camelia. Very pretty. I love the colors you used and the detail in the lines. Beautiful. Very beautiful zendala! Wonderful colors! The composition is well-balanced. Very nicely done! love the colors in this. What pen did you use? also like your attention to detail. The center is very special! Like the alternating Munchin. Makes a great pattern. This is very lovely. I love the colors too! Great!!!!! Great details, lovely colors. Wow wow wow! 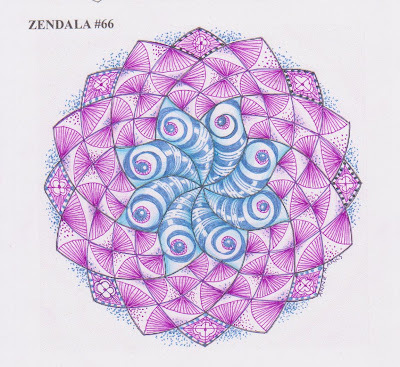 I love your Zendala and the beautiful colors. Very pretty! Your line work is amazing and the colors are spectacular. Lovely use of color. It's very pretty! I love it, well done!